Crochet hooks are made in a very wide range of materials, with a plastic crochet hook being the cheapest choice. When you’re looking to buy crochet hooks, it might be tempting to go for a low-priced option at your local discount shop. At Habbedash we chose not to have plastic crochet hooks for sale. The reason is this: a crochet hook is the most important purchase when crocheting, and plastic hooks often disappoint when it comes to quality. Read on to find out more about the importance of the right material. When you are crocheting away vigorously with a plastic crochet hook, you’ll probably notice that the hook starts to bend a little. This is because the warmth of your hand warms up the molecules in the plastic, and softens it. Subsequently, the pressure of your hand bends the softened material. Crocheting with bended hooks is of course both uncomfortable and unpractical. Also, plastic crochet hooks tend to break easily. Another disadvantage of a plastic crochet hook is that quite often the measurements of the hooks are incorrect. For example, a plastic crochet hook can be advertised as 3.5mm, but in reality be only 3.0mm. That’s a huge difference for the resulting gauges. Unfortunately, unreliable sizes are a problem with many plastic crochet hooks for sale at cheap retailers. So why stick to plastic if you buy crochet hooks? If you dive into the world of crochet hooks, infinite options present themselves. 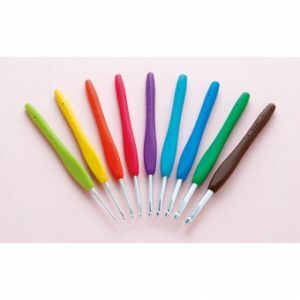 Established quality brands such as Clover and Tulip have a wide selection of crochet hooks for sale that are made of sturdy metal, have comfortable colourful handles and are easy in use. High-end brand Furls has beautiful ergonomically shaped hooks, made of precious woods or even coated with gold. If you’re really into crocheting, a comfortable and reliable crochet hook is definitely not something to cut back on. To discover all options to buy good quality crochet hooks , please have a look around in our shop. Feel free to ask questions about the right hook for you. We’re happy to help!